In July of 1966 an article reading “Lee House Preservation is Sought” appeared in the Richmond Daily Dispatch. The Stonewall Jackson Memorial organization was hoping to preserve General Robert E. Lee’s Richmond residence, along with the surrounding areas. A plan was devised to obtain the property on either side of the house to create a park and recreational area, while also restoring the Lee House. By September of that year the plans to build a park area had been thrown out, and the plan to restore General Lee’s house had been taken up by the Confederate Memorial Literary Society. The society struggled to come up with the funds to restore the house, while also trying to fend off attempts by local companies to help fund the restoration on the condition that they were provided part of the house or its land for additional industrial development. 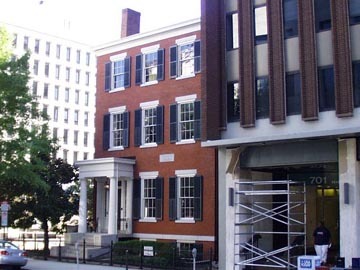 In December, Seventh and Franklin Incorporated had razed the ground next to Lee’s house and started to develop yet another office building that would dwarf the tiny historical residence. Within a six-month period the attempt to “incorporate the home as a shrine and rehabilitate it,” had failed. ; the battle to preserve the house’s dignity and importance had been waged and lost. 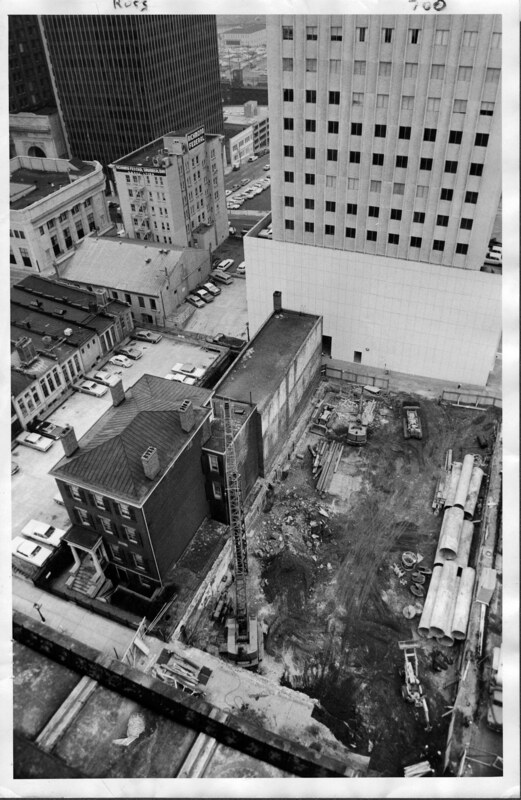 Construction adjacent to the Robert E. Lee House, 1966. 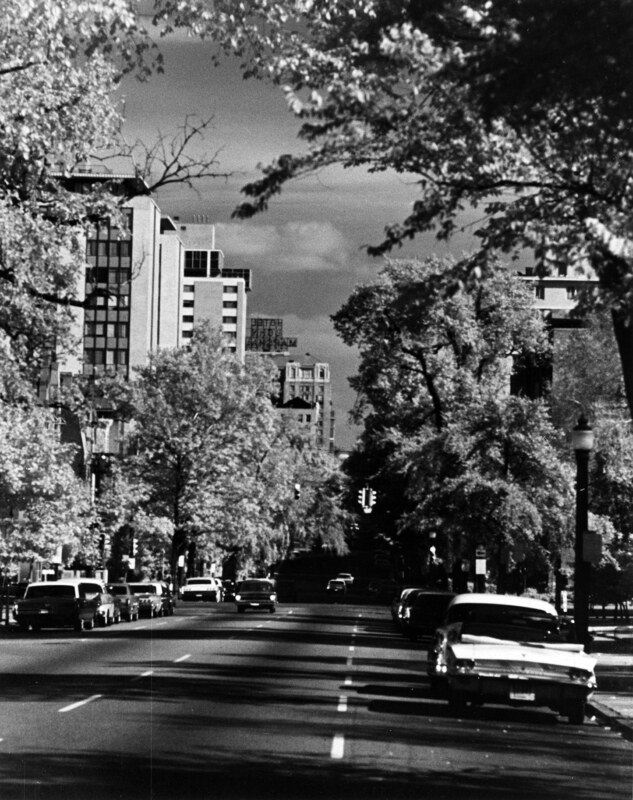 In the sixties the desire to move into the modern age influenced Richmond’s growth.In Richmond this is clearly seen in the development of land, the physical restructuring of the city and the danger that historical sites faced due to expansion. While many other changes were going on in the city, it was the building development that redefined Franklin Street. When looking east on Franklin Street, from Laurel Street, the change in the view between the turn of the century and 1961 is drastic.Advancement and growth are beneficial to a city in that they save it from stagnation and help boost the local economy, but, just as much can be lost as gained through development. Franklin Street at the turn of the century. Throughout most of the twentieth century the residents of Franklin Street fervently opposed development other than residential construction or addition. In the thirties and forties there were many disputes brought before courts and zoning boards opposing industrial development, and petitioning to have Franklin Street classified as a Residential District. While these petitions were temporarily successful, by the early sixties industrial development had wheedled its way onto Franklin Street. High-rise office buildings, parking lots, and filling stations quickly consumed what had historically been a street of fashionable residences. Franklin Street was a place where people aspired to live. 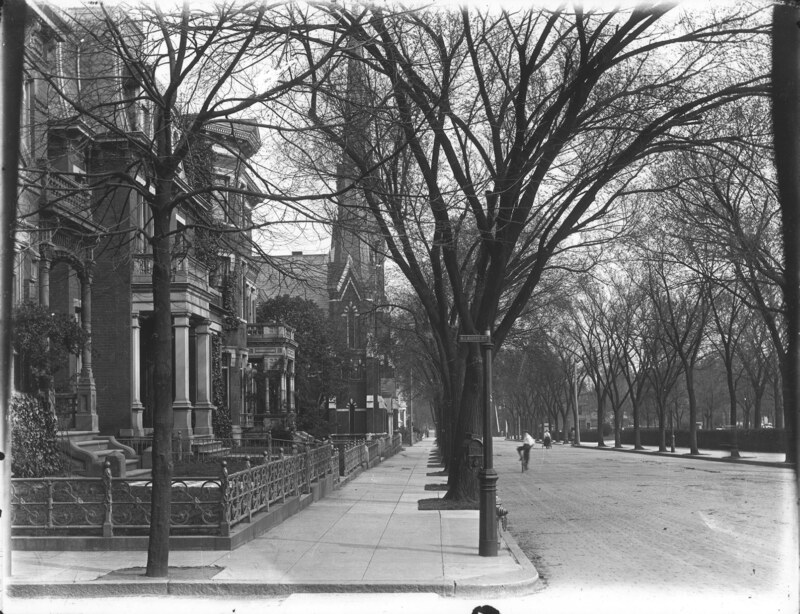 As Franklin Street was home to the high society of Richmond, they were devoted to maintaining the street’s dignity by keeping their distance from the grime of industrialized Richmond. In 1932 the Franklin Street community rallied against Mr. J.L. Moon when he attempted to erect a filling station on his property. Two years later “fearful lest Monday programs be disturbed by racing motors and blowing horns, that afternoon tea be perfumed with gasoline fumes, that members going to meetings have to dodge cars coming for refills,” a woman’s group was “up in arms” opposing another attempt at locating a filling station on Franklin Street. The members of the exclusive Woman’s Club were so incited at the idea of a gas station next to their clubhouse that they protested and filed every possible objection and petition to keep the station far away. Yet, less then twenty years later, it is hard to find a single committee to even dedicate themselves to preserving a piece of Franklin Street, much less to see the project through. The Lee House had so much history, yet so many organizations that started with good intentions eventually came to see its preservation as a project to be passed on so that their funds could be put to better use. The Lee House was built between 1844 and 1849, and was given to General Robert E. Lee during the beginning of the war. Lee’s son Custis along with other officers used the house until Lee’s wife and daughter moved into it in 1864. The Lees occupied the house until June 1865. After the Lee’s moved the house was rented to various tenants including the Westmoreland Club and a girls’ school until 1893 when the building was given to the Virginia Historical Society. In 1959 the building again changed hands and was given to the Museum of the Confederacy, by the heirs of the architect who had originally designed the house and gifted it to Robert E. Lee. The house was deeded over to the Historic Richmond Foundation in 1980 and has been used as offices for various businesses ever since. Though the house still stands, so much history has been lost over the years, which is ironic in the face that for a majority of its life the house has been owned by historic societies. 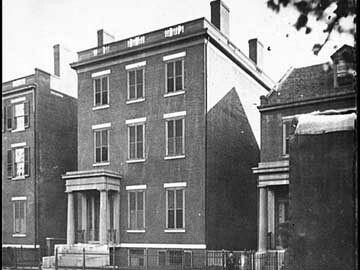 Today many people do not know that General Robert E. Lee and his family had residence in Richmond during the Civil War.Many people do not know that it still stands on Franklin Street, between Seventh and Eighth Street, just across the street from the Juvenile Justice Department in downtown Richmond. Moreover, many people do not know that it has been cleansed of its historic value, throughout the years, and more recently as it has been turned into a series of office suites for various businesses. General Robert E. Lee’s house has seen more than 150 years of history, yet sits so unassumingly amongst the concrete jungle that is the business district of Franklin Street. Franklin Street has lost its history. There was a time when “the social ambition of every Richmonder was to live on Franklin Street,” yet, “now even the blocks where an old house or two remain are pockmarked with parking lots.” Some houses that still stand have been architecturally altered throughout time, and now hardly resemble what they were originally. In other places, the houses of Franklin Street’s high society have been leveled to make way for industrial development. “A great gasoline sign broods over the door through which Lee passed when he returned from Appomattox,” a newspaper observed in 1942, shadowing the doorway as office buildings now shadow the history of Franklin Street. In 1942 development was already being noted as destroying the history of Richmond and of Franklin Street in particular. Today, while there are memorials or markers to cite historical event and places, so much history has been lost over time that we are hard pressed to recover it, and to preserve what history is left. Development on Franklin Street both destroyed and created history. Stories have been lost among the development to herald a new era in Richmond. Yet, it is the absence of these historical markers that have brought stories into focus, and have made the preservation of the existing history that much more important and precious. The Richmond we see today, before our eyes, will one day be history as well. We cannot now predict what pieces will be important to preserve for the future, and which pieces can be displaced because in truth every story, picture and memory offers insight into a time that is not our own. The loss of history in Richmond is devastating, yet it also makes room for new history. It is a continuous cycle of loss and recovery, which, while distressing, is unavoidable and important to the construction of history yet to be made. “Lee House Preservation Is Sought,” Richmond Daily Dispatch, July 24,1966. Goodwin, Susan and Becky Bradley. “1960-1969.” American Cultural History. Lone Star College-Kingwood Library. Last modified July 2010. http://wwwappskc.lonestar.edu/popculture/decade60.html. “West Franklin Street at Laurel Street,” 1896. Cook Collection, Valentine Richmond History Center, 4826. “Franklin Street, Looking East,” 1961. Valentine Richmond History Center, P.71.21.36. “Woman’s Club Fights Move To Put Gas Station next Door,” Richmond Daily Dispatch, May 11, 1934. “Zoning Board Rejects Change In Franklin Street,” Richmond Daily Dispatch, May 12, 1932. National Park Service, “East Franklin Street Historic District,” Discover Our Shared Heritage: Richmond, last modified December 8, 2009, http://www.nps.gov/history/nr/travel/richmond/EastFranklin.html. “Museum Transfers Lee House,” Richmond Daily Dispatch, March 19, 1980. Library Of Congress, “Richmond, Va. Residence of Gen. Robert E. Lee (707 East Franklin Street),” 1865, http://www.loc.gov/pictures/item/cwp2003000689/PP/.